Description: Imagine laying in a hospital bed, listening to your doctor discuss removing feeding tubes with your loved ones, while you struggle to let them know you’re not ready to die. 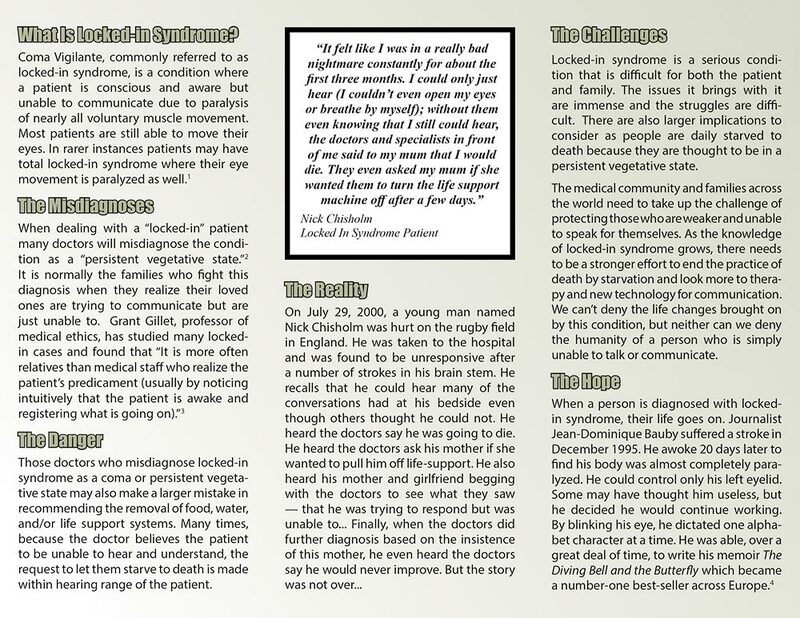 Those who suffer with locked-in syndrome are conscious and aware of their surroundings, they simply have very little muscle control. In some cases, patients have learned to communicate with eye blinks. Discusses the truth that killing the weak is simply not right. We got some of these for our pro-life case at church. People do not want to know about this. It is an effective tool if we can get people to look at it. Very, very good information is in this brochure. Very hard for some to acknowledge. OMG! You have to get this and help to educate the people that, sometimes dying with dignity is NOT the way to go. Don't buy into what the doctors say. They have been wrong!